There are several different reasons why you might choose to cancel a credit card account. When you are paying interest rates that are too high, when another company offers you better rewards, when you have to pay a yearly maintenance fee to keep the card, and when you simply do not use the card very often. Before you decide to cancel a card it is imperative that you consider the following things. These considerations could save you time, money, and frustration. 1. 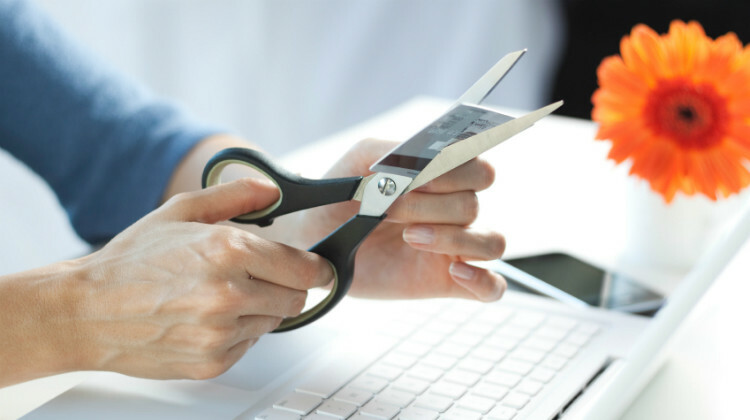 What effect will closing the card have on your credit score? When you close an existing credit card account you hurt your credit score in two different ways. It reduces your available credit. Whenever your credit is evaluated by the credit reporting agencies they look at the following things before determining your score. The amount of credit that you have on each of your current credit cards, and loans, is added up to determine exactly how much credit you have. Credit cards are considered to be revolving credit accounts. The other basic type of credit comes from installment loans like automobile loans. You need a healthy mixture of revolving credit accounts and installment accounts to maintain a good score. Closing your account could cause the balance you have established between revolving accounts and installment accounts to be disrupted. When you take out a loan, or make charges on one of the cards you carry, it uses a portion of your available credit. You want to have at least one-fourth of your total accumulated credit available for use in order to keep your credit score high. If your total available credit is less than thirty percent of your total accumulated credit then your score will be lowered. Closing an account can reduce your total accumulated credit and that may cause your available credit to fall below the thirty percent ratio. If that happens you are going to damage your score. The way that you pay your accounts affects your credit score. If you pay your obligations in a timely manner, and do not default on loans, then your score is raised. It affects your credit history. The length of time that you have had an account open is very important. The longer you have an account open the more time you have to prove that you make your payments in a timely manner. If all of your accounts are new then lenders are uncertain whether you will maintain your obligations towards your payments. If the account you are closing is one that you have had open for a long time consider negotiating with the company for a lower interest rate before you shut the account down. You want to keep your oldest accounts open to prove that you are reliable. 2. Stop any automatic payments. If you do decide that you want to close an account you have to make certain that any automatic payments are transferred to another credit card account. You do not want to have an automatic payment not be covered because that will affect your score, and depending on the type of automatic payment it could cause you trouble with the company that the payment is being made to. Look at your statement carefully to make sure that you call all of the companies that receive automatic payments from that account and transfer them to another payment source. Make a list of the company that you called. Include your account number on the list and be sure that you write down the day you called and the name of the representative that you spoke to. Make a note of the new payment source that you provided to the representative. If there is any confusion about the transfer of accounts you will have all of the information you need to prove that you called. This could save you from having to pay late fees, or having something like your insurance canceled. 3. Pay off the balance. Use all reward points. If you have an account that offers rewards like frequent flyer miles you want to be sure that you cash in those rewards before you notify the financial institution that you are canceling the card. Check with the financial institution to get the correct pay-off amount. You cannot close an account that has an outstanding balance. You will need to either pay off the outstanding balance on the card, or you can transfer the outstanding balance over to another card. The amount that you owe in full on the account may be more, or less, than what is shown on your monthly statement. The interest on your card may cause you to owe more than what is shown on your last statement. If you are paying the balance off you may also lower the amount of interest owed on the account. You must call the financial institution that issued the card to find out the exact amount that you owe. 4. Notify the financial institution. You will need to notify the financial institution that issued the card to you of your intention to close the account. You want to call and speak to a representative concerning this matter. You will need your account number, your mailing address, your phone number and personal information like your social security number on hand when you make this call. The representative will need all of that information to verify your identity. When you explain the reason why you are closing the account be kind and patient. Even if you believe that company has not treated you fairly, you need to remain calm during this process. The representative you are speaking with is an employee and they are just trying to do their job. Be kind to them when you speak to them. Wait patiently while they ask all of the questions they are required to ask. Be sure and write down the date that you called the company, and the name of the representative you spoke with. If the account is not properly closed you want to have this information handy. The representative will likely have to list your reason why you are closing the account. At this time they may offer you other types of credit accounts to try and retain your business. It is harder for a company to establish a new client than it is for them to retain an existing client. The company may offer you lower interest rates, higher incentive points, or other reward programs in order to keep you from closing the account. Listen to the offers and truly consider if any of them would be more beneficial to you than closing the account is going to be. When you get off of the phone with the representative you should write a letter to the company detailing the fact that you are closing the account. You need to include your account number on this letter. This letter is a safeguard just in case the representative does not close the account like you told them to. Be sure to make a copy of this correspondence and keep the copy in your records. Cut the card into small pieces and dispose of it properly. Do not throw away your last statement until you are positive that the account has been closed. You might need the information on this document if the account is not properly closed. 5. Check the status of the card. It can take thirty days, or more, for an account like this to be completely closed. The financial institution may send you correspondence confirming that they have closed the account, but you should check with the major credit reporting agencies to make certain that the account is closed, and is no longer showing up on your credit reports. You may have lingering access to the account via your online account page. You can check the status in this manner, and you can call the financial institution to make sure the account is listed as being closed. You can also check your own credit score to see if the account shows up as active. Once a year, each of the big reporting agencies will allow you to check your credit score for free. That means they allow you to check your score without penalty. Whenever your score is checked it lowers your score, but once a year you can check it with no penalty applied. You want to check and see if the financial institution is still listed as having an open account with you.